Engraved office signs are available to meet the unique needs of your company. 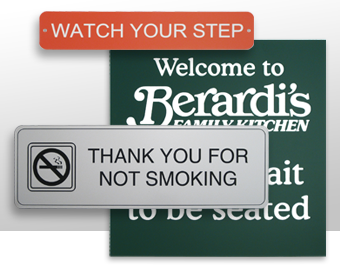 Use wall and door signs to direct clients and customers to the right place, warning and instructional signs to let everyone know of hazards and policies. You select the size, text color and graphics. Select from our wide selection of stock text and graphic signs, or choose to have a sign custom designed for you. All signs are available in a variety of sizes, colors and finish styles so you are sure to find one that will work for your office. 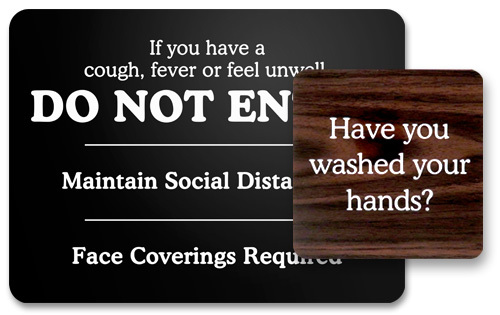 Use signs to help customers and employees navigate your offices. Fast, friendly service: Most orders are ready to ship within two to three business days. Ease of ordering: Order online with our easy to use order forms, or call customer service at 1-800-272-5729 for a personalized quote. Ordering your office signs are as simple as selecting the size, your text and/or graphic, choosing a sign color that complements your office decor and deciding how you want to attach the sign to the door or wall. With over 200 text/size options you are sure to find what you need. Small door and wall signs help to keep offices organized and efficient. Choose from 70+ stock titles. Titles with graphics are also available. Draw attention to important information with these large signs. Choose from 70+ stock titles, some with graphics. Large, highly visible signs to draw attention to important information and policies. Choose from 40+ stock titles, some with graphics. Square signs have plenty of room for large, highly visible text and graphics. Choose from 40+ stock titles, with and without graphics. Custom signs may be designed with your text, logo and graphics. Use for your business, to name a cabin or room, or present an inspirational quote. Choose the size, color, font, text and an optional logo or graphic to create the perfect sign for your office, home, or to give as a gift for a friend, loved one or yourself. You will receive a free quote and proof of your layout prior to production. Pricing is based on the size of the sign and includes the text and/or graphics. Signs are available from 20 to 144 square inches with 29 plastic color combinations. 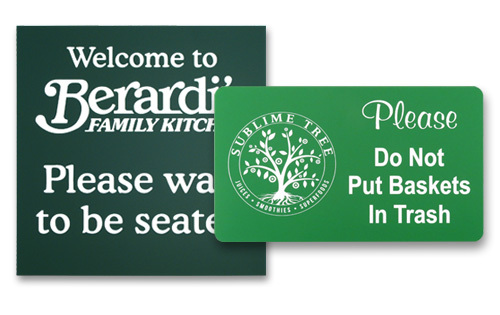 Order a custom sign with your own text, perfect when the text desired is not available on a stock sign. Customize your sign by adding a company logo or other graphic.